"The pause that refreshes" could also be a good tagline for Green Arrow Vol. 7: Kingdom. I might be skeptical of a single volume by a new (albeit TV-connected) creative team, bridging the gap between the previous and next ongoing creative teams, as that tends to suggest perhaps-skippable filler material. 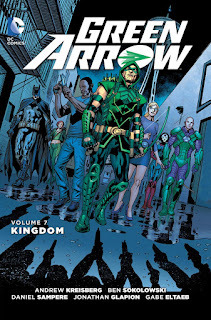 But after Jeff Lemire's three mostly-standalone Green Arrow volumes, CW Arrow's Andrew Kreisberg and Ben Sokoloswki not only further this book's ties to the TV show -- in what I felt were generally inoffensive ways -- but also bring a whole bunch of the DC Universe into the Green Arrow title. Kind of like how Wonder Woman Vol. 7: War-Torn or Batman/Superman Vol. 4: Siege each served to re-center their characters in the DCU just prior to the Convergence/"DC You" changeover, I'm a sucker for these guest-star-heavy kind of tales. Kreisberg and Sokolowski do a good job of balancing action and story in each issue, and though the book's story might seem familiar to Arrow fans, I felt this was a solid outing that increased my enthusiasm for the Green Arrow franchise. The shout-outs to CW's Arrow, Green Arrow's comics mythos, and the DC Universe in general come fast and furious in Kingdom. Batman and new Justice Leaguer Lex Luthor are here, following the events of Justice League Vol. 6: Injustice League; John Diggle continues from Jeff Lemire's run, as does Katana, and the writers introduce Felicity Smoak; we get appearances by Arsenal, Steve Trevor, "Dr. Cross" (another continuity's Dr. Mid-Nite), Mia Darden (another continuity's Speedy and template for Speedy Thea Darden Queen), Cheetah (because, Cheetah), and apparently Tommy "Merlyn" Merlyn; and the writers even take a stab at re-establishing the Green Arrow/Green Lantern partnership, plus Green Arrow-obsessed archer Cupid appears in the background with absolutely no explanation. If this seems like Mad, Mad, Mad, Mad Green Arrow, that's not far off, but the writers balance the cast well and I never felt Oliver Queen was too far from the center of his own title. It should come as no surprise that Kreisberg and Sokoloswki set up a plot in which Oliver is considered to have "failed his city" (not thankfully in so many words) just as an evil philanthropist comes to power intending to redeem the city by destroying it. As with Lemire's Green Arrow Vol. 6: Broken, it's not so clear that Green Arrow has been derelict in his duties so much as the plot needs him to be, and of course the book's John King shares much the same motives as Arrow's Malcom Merlyn, Ra's al Ghul, and Damien Darhk. That might seem re-treading old ground to some, though I didn't mind seeing a traditional Arrow plot laid out against a DCU background. No doubt Felicity Smoak is a polarizing figure in Arrow fandom, less so in the earlier seasons than more recently. Something I liked about Kingdom overall is that in teaming primarily just Oliver, Diggle, and Felicity, and with no hint of romantic ties between Oliver and Felicity, Kingdom evokes the slimmed-down Arrow of the early seasons (something I hope the newest season of Arrow will itself get back to). Kreisberg and Sokoloswki get the TV-inspired voices of the characters right, especially Felicity and her random asides (set in small type by letterer Rob Leigh). I also appreciated that the writers didn't behold themselves completely to TV lore, willing to take the probably-controversial step of making the comics-Felicity an admitted murderer (or complicit thereof) rather than make her wholly benevolent. I'll be curious to see how Benjamin Percy's ongoing Green Arrow run uses, or doesn't, the players from Green Arrow Vol. 7: Kingdom. The New 52's history of Green Arrow has been a muddle, retroactively adding in Teams Arrow past like Roy Harper and John Diggle, though Jeff Lemire, Andrew Kreisberg, Ben Sokoloswki have all done a good job of using or writing out characters such to make these various teams all feel part of a continuum. Kingdom is a solid Green Arrow story, evocative of the best of Arrow but using liberally as well the DC Universe, which is a fine mash-up for me. Daniel Sampere draws the whole thing well, adhering to photorealism noticeably only with the Felicity character. For a quick Green Arrow fix, this is a one-off I could see myself reading again. I thought the book was kind of bland, but some of it may be due to the crash after the Lemire high. I also didn't like Felicity's introduction, as it felt forced, and her character mirrored the TV show too much. A few tweaks would have been welcomed, like Lemire's Diggle. I'm looking forward, however, to Percy's run in the next volume and onward into Rebirth. For me, the suggestion that this Felicity was essentially a criminal, up to and including killing people or assisting in having them killed, was sufficient difference for me. At the same time, the writers suggest this and then back away from it significantly, whereas I wished they might have embraced the difference (controversial difference, no less) more fully.